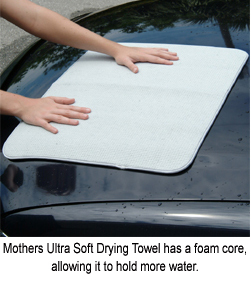 Mothers Ultra Soft Drying Towel has a foam core wrapped in microfiber to quickly towel-dry your vehicle after washing. Waffle weave plus a foam core provide awesome absorption! The best way to prevent water spots on your pristine paint finish is towel-drying the vehicle after each wash. Mothers Ultra Soft Drying Towel is a large microfiber towel with an absorbent foam core that inhales every drop of water to leave your vehicle dry and spotless. The secret to the towel’s tremendous thirst is the internal foam surrounded by waffle weave microfiber. The waffle weave nearly doubles the surface area of the towel so there are more fibers to hold more water. The internal foam is thin, so as to be less bulky, but it drastically increases the towel’s capacity for moisture. Besides its excellent absorbency, Mothers Ultra Soft Drying Towel is ultra safe on any surface. The silky microfibers glide over the vehicle’s surface without causing swirls or scratches. The towel is safe on glass, paint, clear coats, and plastic. Plus, the towel has a finished, satin edge that further protects the vehicle from micro-marring during the detailing process. Mothers Ultra Soft Drying Towel does not shed lint and it retains its super soft texture better than terry cloth towels. After you wash your vehicle in Mothers California Gold Car Wash and rinse, immediately dry the vehicle with Mothers Ultra Soft Drying Towel to prevent water spots and keep your vehicle looking its best. Care for your microfiber towels by washing them in your washing machine with Pinnacle Micro Rejuvenator . Skip the fabric softener and bleach. Pinnacle’s gentle detergent will clean and refresh the microfiber. Tumble dry on low or air dry. Dry your vehicle with the gentle touch of Mothers Ultra Soft Drying Towel! Bought one of these earlier this year and it does exactly what its supposed to do. I plan on buying a second one to have around too. You can't go wrong with this. Bought this based on other reviews here expecting to dry my 11 Jeep WK2 with the use of one or two towels. This product didn't make it past half of the roof and wringing it out is much harder then the normal waffle weave towels as it is much thicker. The thickness didn't seem to help at all for absorbency. I don't recommend this product. By far the nicest drying towel I have had the pleasure of owning. Super soft and absorbant, it is a must have on my arsenal. I plan on additional.g more of these to my collection. I was using the Cobra Guzzler HDs for several years. They work OK however they get filled quickly and require multiple wring-outs per towel. To truly soak up all water I would need at least two Cobra Guzzler HDs. It is not like I wasn't treating them right - I would wash them after every other use, or if they got dirty in any way, with Micro Restore and let them air dry. After discovering the Mothers towel, I now can use one fantastic towel to easily soak up all the water on a vehicle, with no smearing or left over moisture. And now I use the Cobra HDs to finish dry and buff of post-drying Optimum Instant Detailer or Optimum Car Wax. The Mothers towel is THICK and large! It has to be at least 4 times as thick as a Cobra HD. It will be stiffer than most, because of the core, but that doesn't matter. It fold easily and works so well!